Someone decided to dust off the old, classic California Zephyr and run it from the Bay Area up into the Sierra's to Portola. 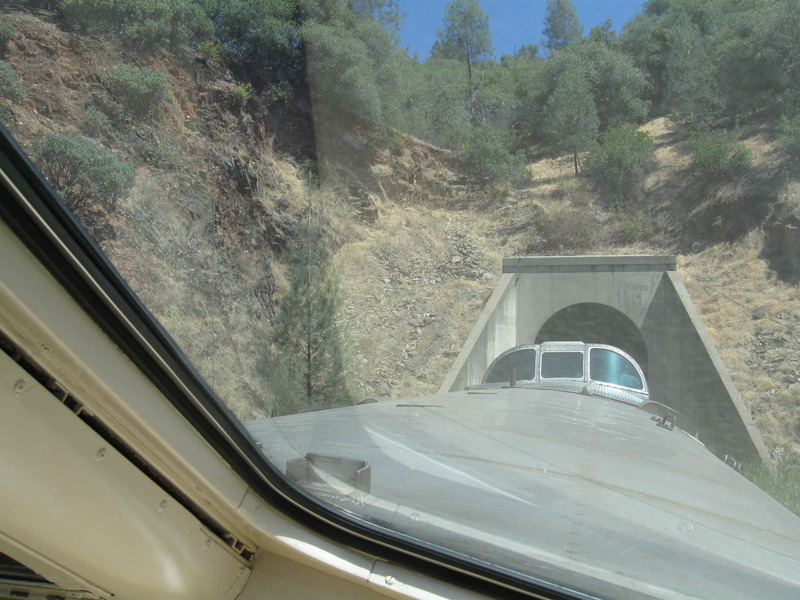 The route was the Feather River Canyon, a scenic route that offers stunning views of the terrain and river. Passenger trains normally do not run on this route, rather they go over Donner Pass. That ride is not nearly as dynamic as the Feather River run. There are many tunnels some quite long in length. It made for interesting passage as some of the lighting systems in the old cars did not function properly creating total darkness. Tanya drove me and my bicycle to the train station in Davis. It was scheduled to arrive at 9:30. Sometime around 10:30 the train approached. I stood by the tracks with camera in hand waiting to get a photo of the classic locomotive. 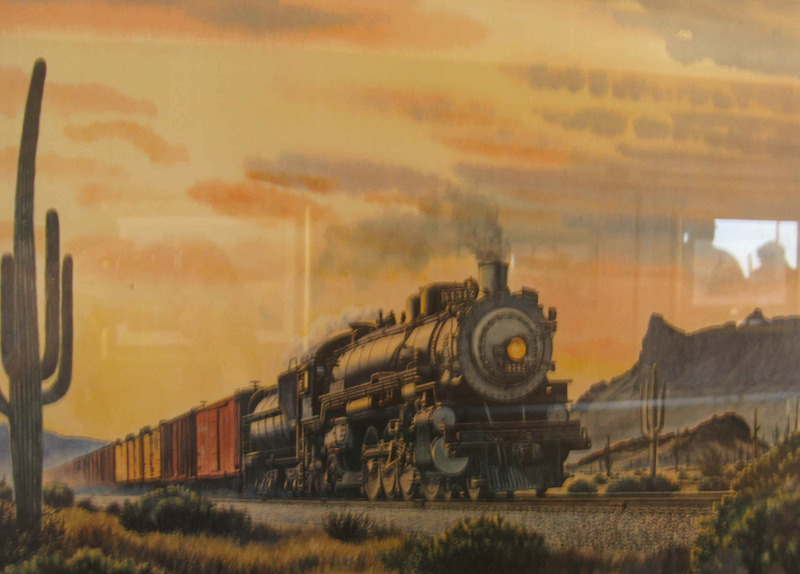 I was disappointed to see that the engines were not the handsome beauties of yesteryear, but modern Amtrak diesels. The cars were of the older era. The train stopped at the station and several people boarded. From Davis to Sacramento the train reached its fastest speed that it would see all day. The Zephyr flew down the tracks at speeds of around 70. We were right next to I-80 and were passing the cars in the fast lane. They go at least 70. That was it for the fast transit. After Sac. the train rarely got above 40 mph. When it began the climb into the foothills, it slowed even more. The drive in a car takes about four hours. The train took nine hours. Eventually it did arrive in Portola. We were offered a Mexican meal for twelve bucks. It was among the worst I've ever had. Nothing about it was redeemable. The desert was a bizarre concoction of colored marshmallows, sugar and some sickly sweet white sauce. A few people walked the several blocks into town to check out "Railroad Days". There was a carnival atmosphere in the small town. Booths of crafts were on the main street. A tent was erected for the all-you-can-eat pancake breakfast. 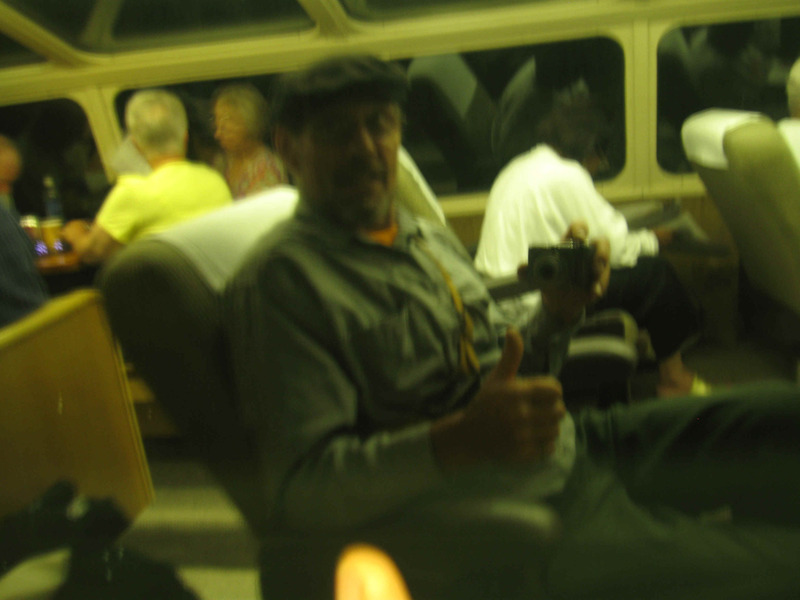 Many people were staying on the train in the old Pullman cars. Others went to motels. 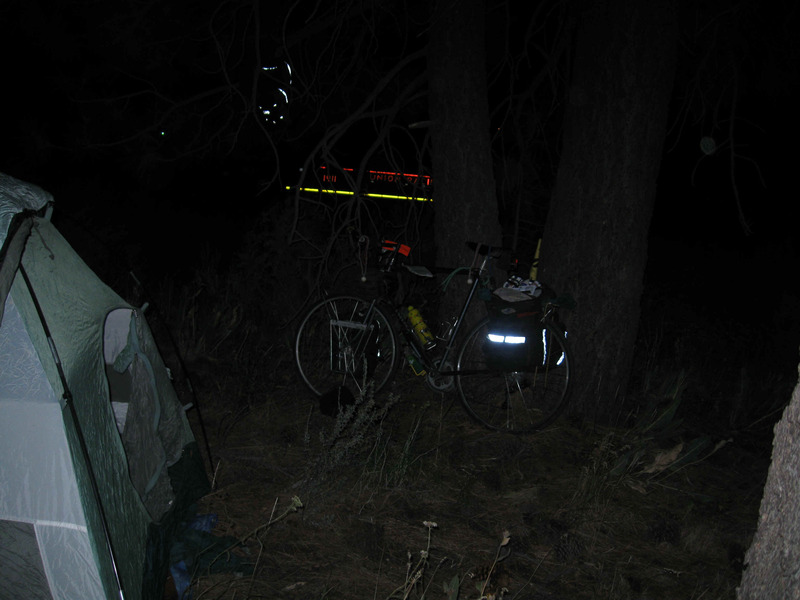 After dark, I selected a campsite near the rail yard, pitched my tent and spent a peaceful evening under a tall stand of ponderosa pines. In the morning I was supposed to get with Long John to do some filming. Try as I might I could not locate him. I was anxious to get started on my cycling adventure. I had set a deadline of Tuesday to get back to Middletown. It was just over 200 miles and I figured I could do it in three to four days. Another factor that influenced my thinking was information about my route from locals. Route A-23 has a reputation for very high winds in the wrong direction. They tend to increase towards afternoon. I bought a poppy seed muffin from a coffee shop that apparently didn't like bicycles. The owner lady made an incredible scene regarding the placement of my bicycle against the side of here building. It was so ridiculous that I wrote it off to a bad adjustment on her medication or a severe hormone imbalance. This was perhaps my penance for ditching Long John. The thrill of being on a mission filled my senses. It was exciting to be on the road. I climbed out of Portola for about a mile. The road leveled and became scenic in a stark, empty sort of way. 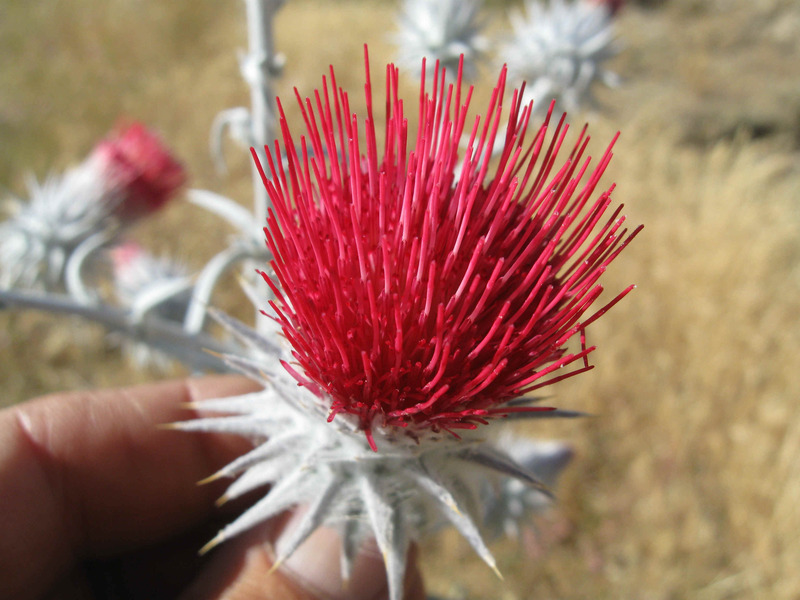 I was east of the Sierra crest in sage brush country. 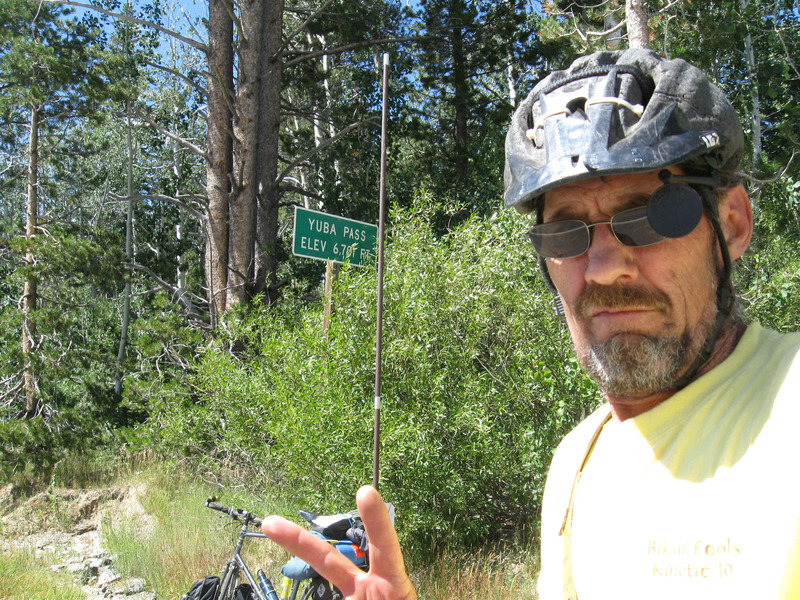 I was in a huge, flat valley I wouldn't get back into the forests until the climb over Yuba Pass. Although the road was ideal in many ways, no traffic and nearly level the dreaded winds were already blowing. The large panniers on the bike acted like barn doors, slowing me at times to a mere crawl. It would take an unreasonable amount of time to process the twenty three miles to Highway 49. I have only done maintenance rides for the past couple of years, with a few longer rides on occasion. I was uncertain about my fitness. I made a strong effort to stay at a low power output. Although at times I wanted to jam, I knew I had to be in the saddle all day. Eventually I came to Hwy. 49. I stopped shortly after beginning the seven mile climb to eat breakfast. I prepared my special oatmeal blend to power my day. It worked. I returned to the saddle and began the tedious climb at snail speed to the summit. Once over Yuba Pass the road was downhill for over thirty miles. Although it was Saturday, the traffic was minimal. 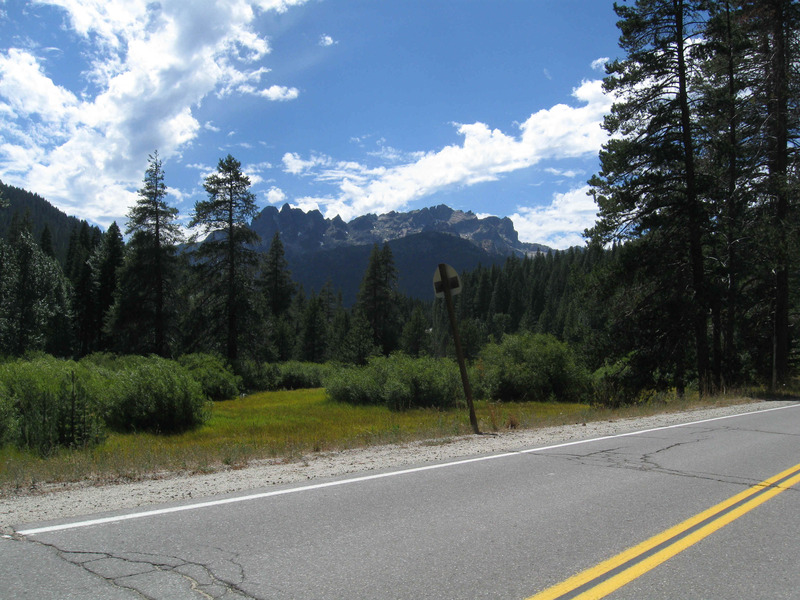 From Basset to Downieville there tends to be more traffic associated with the very popular mt. bikin' in the area. The cruise was pleasant and swift all the way to Downieville where I sought out the local bar and dropped in for a cold, refreshing, naturally carbonated beverage. The bar was virtually empty. I had a nice pause in the ride. After the refreshment I spent a short amount of time lounging near the river taking in the scene of tired and weary mt. bikers. The day was now growing long. 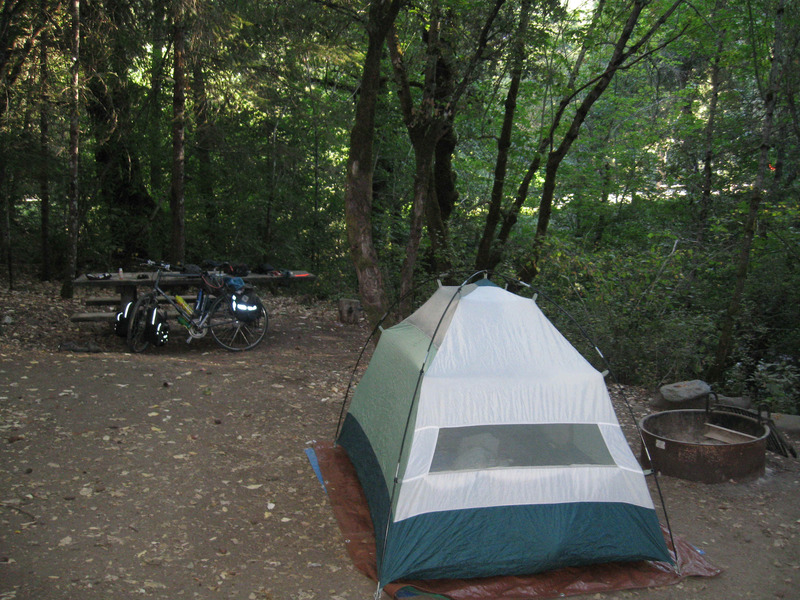 I knew I had pretty much used up my allotment of fuel for the day and began looking for a campground. 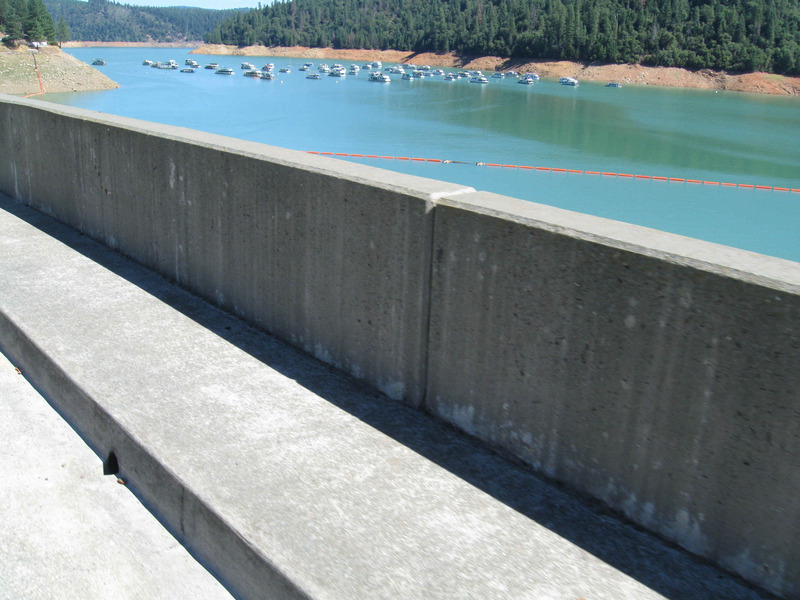 There are several downstream from Downieville. Each was full with two exceptions. Both that had slots were on the uphill side of the highway and much less desirable than the riverside spots. The first possibility had neighbors that were clearly going to be a problem. The second turned out serendipitous. Initially it seemed kind of funky. Upon further inspection I found a nice, well shielded sight near another, small stream. The babbling brook would serenade me all night. I knew that I faced a major climb in the morning. I packed up the mobile home site and hit the road. Within a mile the highway crossed the Downie River and began a four mile climb. I struggled to stay at a slow pace. It paid off as I slowly, but easily made the ascent. Finally at the top I turned on Marysville Highway and began another long section of downhill riding. With just a couple of exceptions, the road descended for ten miles. About mid-morning I again stopped to eat breakfast at a spot overlooking Bullards Bar lake and recreation area. A very nice singletrack passed through this area. Another significant climb began after the lake. Again I tried to regulate my energy. The road had somewhat more traffic. It was Sunday afternoon and many of the weekend revelers were headed home. Marysville Highway continued for several more miles before arriving at Hwy 20. This road was great all the way to Lake Co. The berms were wide, clean and smooth. It was a bicyclist's dream. 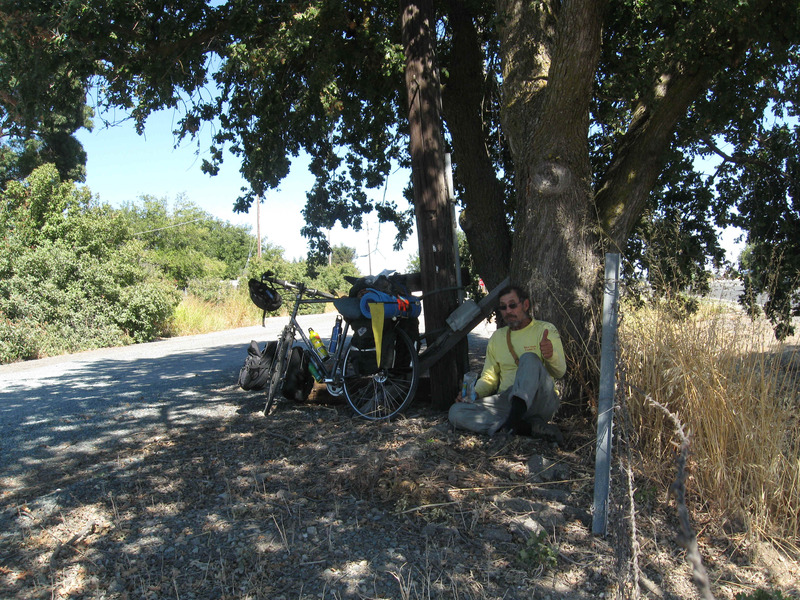 I stopped at a fruit stand, purchased several fresh, ripe figs and continued to Yuba City. The passage through town was not much slower than the cars. On the west side of town I hit the wall. It was time for a break. I had covered about 70 miles so far in the day. After a handful of trail mix and a power nap, I hit the road. I knew I could make it to Colusa. I would decide there what would be the plan for the night. The 18 miles were a little tedious. I was tired and needed electrolyte therapy (beer). 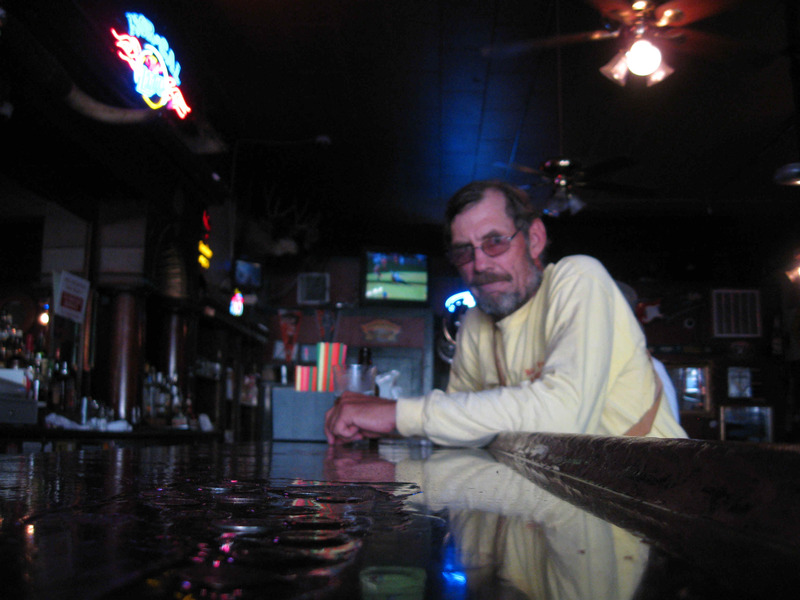 When I finally arrived in Colusa I found the Sportsman's Bar. This was one of America's sad example of shear stupidity. The back of the bar was littered with inane bumper stickers such as; "Single women can't fart, they don't have assholes" The barmaid was an angry lady with a bad attitude. I asked; "Do you have draught beer?" "NO!" She stated. "Okay," I said, "I'll have a bottle of Sierra Nevada." She stared at me for a moment then walked away and returned with the bottle. "Can I get a glass?" Again she stared at me as if I had told her just how ugly her mother was. She turned, walked to the cooler and brought me a frosty glass. That was the end of the association. Now tired, I wondered about the accommodations for the night. There were no possibilities for camping (legally). 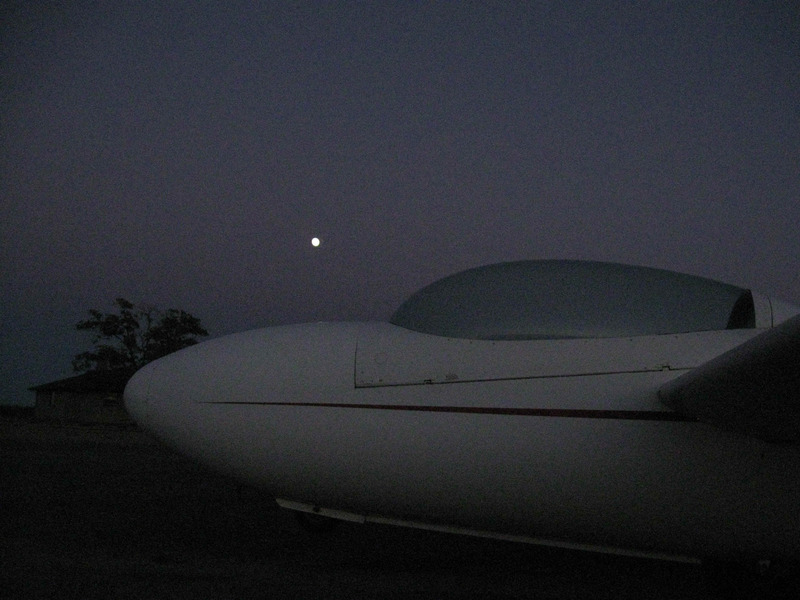 My plan was to simply ride easily, take my time until darkness set in and get off the road and out of sight. At night the rules change. There are no rangers, the land owners are in bed. I noticed a small plane landing as I approached Williams. "O' yea" I thought, "There is a gliderport here." 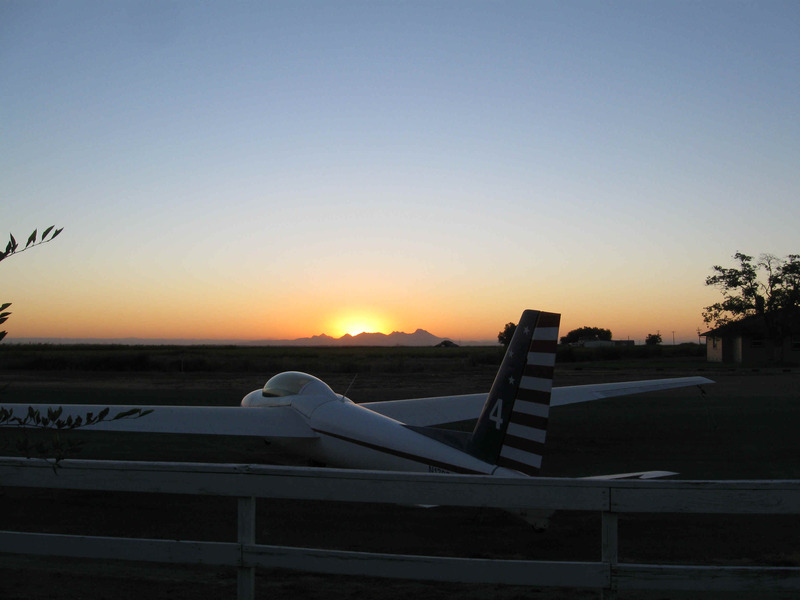 Since I am a glider pilot I knew I could find safe refuge at the airport. As I approached I saw a large number of people at the operations building having a picnic. It turns out that they had just had a contest over the weekend. Once my name was announced I was welcomed and invited to have food and join the party. Serendipity again visited my trip. I was up early. I packed my bags and headed into Williams for coffee at Granzella's, a well know restaurant in the area. I took my time waiting to become fully awake. I knew I had a tough day ahead. This would be the biggest day of climbing as I headed back into the coastal mountains. Hwy 20 yielded its generous berms and offered some hazardous miles to tiptoe along the ragged edge of the road as eighteen wheelers thundered past inches away. These sections of road were stressful and taxing. The first climb was about eight miles long. It was gentle but unrelenting. My speed went into the warp zone on the other side of the hill. Time wise, the descent lasted only a few minutes before I began the next climb. This was not as long, but painfully steep. After the climb I was ready for breakfast. I stopped at the Judge Davis trailhead and cooked my favorite oatmeal blend. After relaxing for an extended period, I began the final leg of the journey. I coasted downhill for a mile or so, then began the third climb. This was mercifully short and put me at the top of Resurrection Hill, a notable part of the Davis Double Century ride. I would be traveling in the opposite direction as the D.C. This is a delightful, several mile downhill run on brand new pavement with very wide shoulders. I rode in comfort and peace. The bottom of this hill is marked by the North Fork of Cache creek. It was hot. I stopped and took a quick dip in the water. It was very cold, yet very rejuvenating. The day was now hot. The final thirty miles would be less than fun. I worked my way to the last climb. It passed with minimal trauma. However near the top of the climb I noticed a 24 inch pipe wrench along the side of the road. This was a road score that I couldn't resist even though it added another ten pounds to my already bloated rig. I breathed a sigh of relief as I crested the hill. Now there would only be a couple of small bumps for the last twenty miles to Middletown. I stopped in Clear Lake for some food and water. The temperature was nudging the 100 degree mark. Outside of Clear Lake the highway turned mean. A recent paving job called "chip seal" made the surface extremely bumpy and unpleasant. 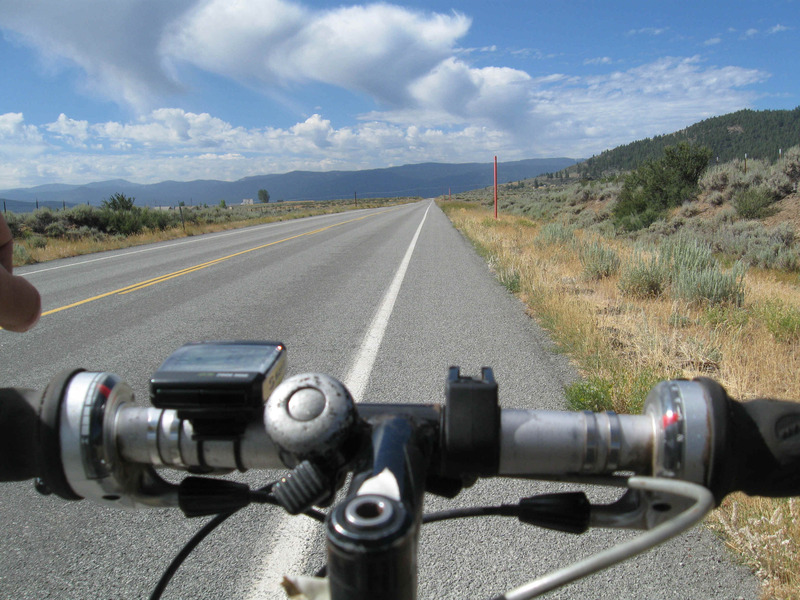 I pedaled with some enthusiasm even though my body was thrashed from the three days of work. The miles slid past as I approached home. Thoughts of a beer at the brew pub keep the spirit high. Just outside of town a Toyota pickup pulled to the side of the road. 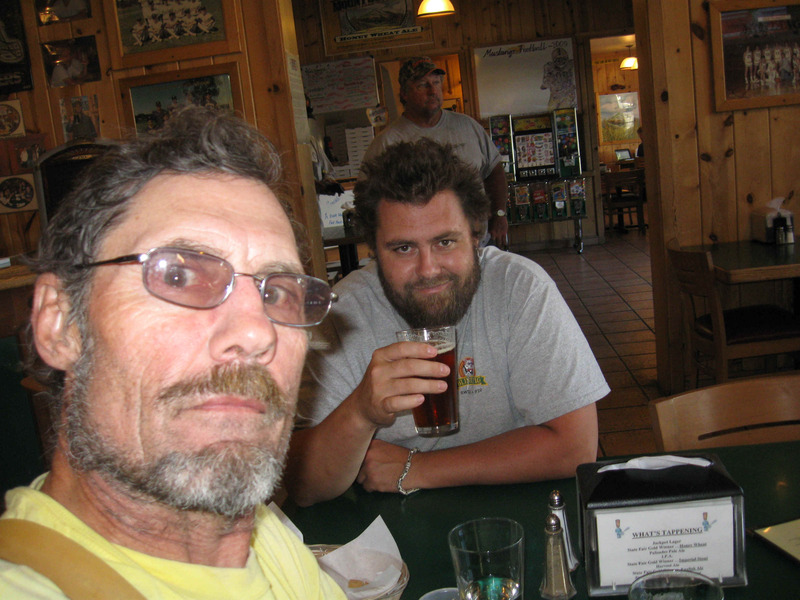 In my weary state I didn't immediatlely recognise my son Austin. He asked me how I was doing. I responded that I was looking forward to a beer. He said he would meet me in town. The last mile to Middletown is downhill, a fitting end to this short but fun tour. It was 216 miles and nearly ten thousand feet of climbing for the three days. The event spanned a variety of fun items from the train ride to camping, fully loaded cycling and the associated surprises that consitute bicycle touring.